I was able to get some daily practice in today. 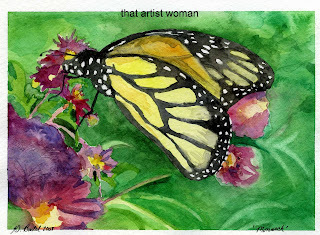 The reference photo is a Monarch sitting on some flowers. The flowers and leaves are out of focus on the photo with the butterfly taking center stage. I fussed over the background longer than I should have, so much for being loose. When background was dry off with the custom sticker. I then focused on the butterfly. The painting is pretty tight due to the amount of detail in the wings. Oh well .... every time I practice I learn something. In this one I would of changed the background. I'll try that next time and make it larger 11x15 I think. See you next time..... I'm working on a good tutorial for kid friendly batik.